President of the Continental Congress; first Chief Justice of the United States; first Minister of Foreign Affairs; negotiated the Jay Treaty of 1794. 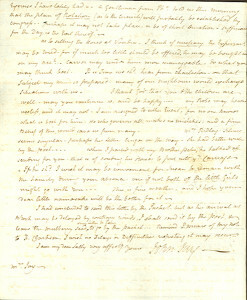 Autograph Letter Signed, two pages, quarto, New Haven, [Connecticut], April 24, 1792. To his wife Sally. “My last to you was written at Bedford; which place I left yesterday, and arrived here this Evening, in good Health. At Norwalk I purchased some Seed of the white mulberry. You will find a little parcel of it herewith enclosed. Peter may plant some of it in our Garden. If they grow we will send them next Spring to Bedford. I have also enclosed some with the Letter for my Brother Peter, which you will find under the same cover with this, and which be so good as to forward by the Boat or other good opportunity. I learn that we shall have much Business to do here, there being about 40 actions. Judge and Mrs. Cushing also arrived this Evening. They made very friendly Inquiries respecting you and the children, and desire to be remembered to You. On the Road I saw Mr Sodershom-he called at our House on Tuesday last, but as you was gone to church, did not see you-it gives me pleasure to find from this that you then was well. He told me Mr. Macomb was in Goal, and that certain others had ceased to be rich-how mutable are human affairs!. Mrs. Macomb must be greatly distressed. Your friendly attention to her would be grateful and proper. “25th Ap. Peel went last Eveng to the post office but returned without Letters. This morning yours of [the] 22 Inst. was sent to me, & I thank You for it. Chearfulness my dear Sally is best promoted by frequently reflecting on the Reasons we have for being chearful, and by attention to the Health both of our minds & Bodies. I regret the Depression you mention, and wish it was in my power forever to banish from your Breast every uneasy Sensation. My Health has been mended by the Exercise I have lately had. A gentleman from Ph[iladelphi]a told us this morning that the plan of Rotation (as to the Circuits) will probably be established by Congress. Perhaps it may not take place, or be of short Duration-sufficient for the Day is the Evil thereof. “As to selling the Horse at Vendue, I think it necessary the Experimt. may be tried, for if much too little should be offered, he may be bought in on my acct. Carver may render him more manageable. Do what you may think best. It is Time we shd. hear from Charleston. On that Subject my mind is prepared. Many of our neighbours would exchange situations with us. I thank God that you & the children are well-may you continue so, and be happy- My Robe may become useless, and it my not. I am resigned to either Event, for no one knows what is best for him. He who governs all, makes no mistakes; and a firm Belief of this, would save us from many. Mrs. Ridley, Silence seems singular-perhaps her Letter, linger on the way. She had better wish by the post- When I parted with my Brother Peter, he talked of sending for you, that is of sending his Horses to put into yr. Carriage. If he shd. I wish it may be convenient for Susan to remain with the family during your absence-one if not both of the little girls might go with you- This is fine weather, and I hope your dear little namesake will be the better for it. In 1789 President George Washington appointed John Jay the first chief justice of the United States Supreme Court, in which capacity he was instrumental in shaping Court procedures in its formative years. His distinguished diplomatic and political career, combined with his early legal experience and several years and chief justice of New York, made him the ideal candidate to be the country’s first chief justice. 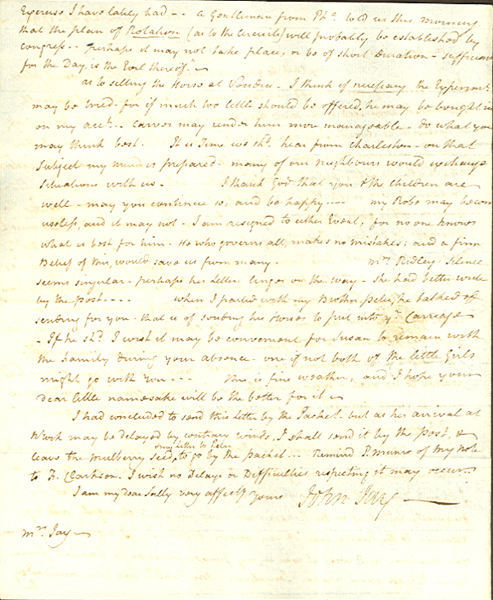 John Jay’s letter reflects on his work as he travels the circuit in Connecticut. The Judiciary Act originally divided the country into three circuits, with members of the court required to travel through the various states hearing cases. The motive behind this system was certainly the need of the federal government to introduce to citizens the principles of the new constitution and government and to bring that government into their community. John Jay’s older brother Peter, whom he mentions in the present letter, was blinded by small pox at age five in the epidemic of 1739.